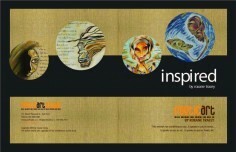 It’s been just over one years since my first Poetic Art book was published, ‘inspired’. I’ve only got one personal copy left but the rest of the books are sold! Right now, I’m thinking about whether I should do a reprint or if I should publish version #2. For now I think I’ll work on developing more products including expanding my line of wearable art that seems to be so popular.